On February 21, in the occupied Crimea, regular hearings were held on the "February 26" case. The trial was held in the Central District Court of Simferopol, the human rights organization Crimean Solidarity reported on Facebook. The occupiers intended to use procedural documents as evidence of activists` guilt. The testimony of the witness Kantemirov were read out repeatedly, and the defense's party made a remark to the judge that it is yet another gross rules violation of the court session, since at this stage of judicial proceedings the testimony should not be repeated again. The next hearings will be held on February 27 at 15:00, it is expected to complete the investigation of the documents announced by the prosecutor. 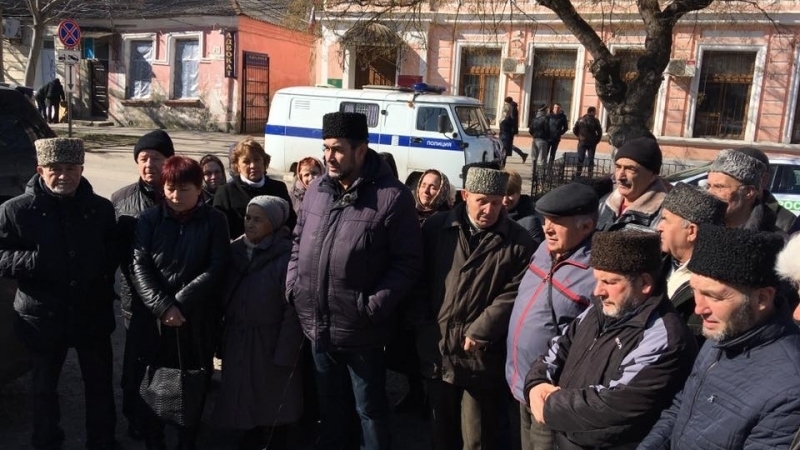 Earlier, the so-called prosecutor's office of Crimea once again changed the indictment against the Crimean Tatars, involved in the so-called "February 26" case. Previously, in the Central District Court of Simferopol, an interrogation was held of one of the defendants who took part in the rally in support of the territorial integrity of Ukraine outside the building of the Supreme Council of the Crimea on February 26, 2014 - Arsen Yunusov. Reference: on December 12, 2017 a regular court meeting was held on the so-called "February 26" case in Simferopol. Earlier, On November 20, the Central District "court" of Simferopol denied the petition of defense for interrogation of the Head of the Mejlis of the Crimean Tatar people Refat Chubarov and Deputy Chairman of the Mejlis Akhtem Chiyhoz as witnesses on the February 26 case, as well as the leader of the Crimean separatists Sergey Aksyonov and the former investigator Pavel Nikel. QHA reported that on October 23, a regular meeting was held on the "26 February" case during which the "court" heard new witnesses in the case. Reportedly, on October 18 in the occupied Crimea in Simferopol another court hearing was held on the "February 26" case against Mustafa Degermendzhi and Ali Asanov. Three witnesses of the rally were summoned to the court, they stated that they were in the court hearing, but they did not see the defendants there. On October 12, the so-called Supreme Court of the occupied Crimea rejected an appeal against the decision to extend the term of house arrest for Mustafa Degermendzhi and Ali Asanov. Reference: Mustafa Degermendzhi and Ali Asanov are figurants of so-called Case of February 26. They are being judged for taking part in the meeting on 26 of February in 2014 outside the building of Supreme Council of Crimea in support of the territorial integrity of Ukraine as well as resisting Russian occupational Army.